These Razor Rs Pinewood Derby Wheels Are For Outlaw Races. Our custom wheel designed for the fastest possible speed. If your rules don't require the official wheels then these are the way to go. 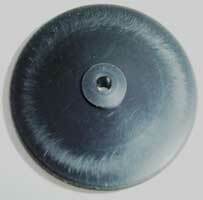 The RS Wheel is a very advanced Pinewood Derby Car Racing Wheel. With features like our, Patent-Pending Anti-Friction Inner Strip, A-Cad engineered design for perfect balance and precision machined from Delrin on a C.N.C. for exacting tolerance, the RS Wheel is ready to run. Just add your choice of lubricant. Machined (not molded) for exacting tolerances - your car will run smooth and fast. Low inertia - Your car will start fast and stay fast. 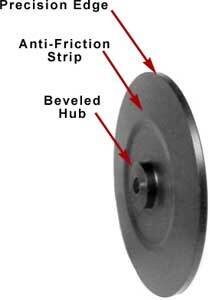 Beveled Hub - reduced friction when the wheel rubs against the axle head or car. 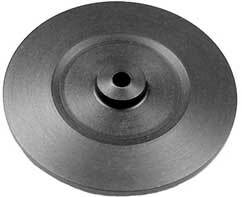 Anti-Friction strip - moves the wheel away from the center track guide with minimum friction. Precision razor edge - small contact area with the track minimizes speed loss due to imperfections on the track. This picture shows a competitor's wheel after several races. Notice the scuff marks created by the wheel rubbing against the guide strip. A lot of friction was created as these scuff marks were made. For our wheel, only the area marked in red will touch the guide strip, minimizing friction. More importantly, the unique shape of our wheel will automatically push the wheel away from the guide strip causing your car to "self-center" as it moves down the track.